So, I couldn’t resist…I bought some more shampoo, hairspray, and toothpaste. They were all on sale! First, Everyday Shea Shampoo in Vanilla Mint. This came in a gigantic size (32 oz.) for $13.99 (about $0.44/oz). I’ll use it for body/hand soap, too, to justify the cost. The mint (spearmint), in my opinion, overpowers the vanilla, but it’s still lovely and makes me feel all happy. It produces a nice lather and doesn’t leave hair feeling…shall I say… TOO clean? If you’ve ever washed your hair with Dr. Bronner’s you know what I’m talking about. It’s not like that at all. Shea butter and oil, as well as coconut oil, are the saponified fats in this product, so it should be quite moisturizing. I’ve only used it for a few days, but so far, my hair seems manageable and not greasy and not crunchy. So far so good. The company uses fair trade ingredients, no synthetic fragrances, no parabens, and does not test on animals. The fragrances are created with essential oils (and they have unscented versions of their products, too). This means no phthalates! Now, I would be remiss if I didn’t discuss an ingredient: cocamidapropyl betaine. This is a surfactant that is synthetically made by chemically manipulating coconut oil and it can be an allergen to some people. If you know you have skin reactions to surfactants, you may want to avoid this product. If I notice anything strange, I’ll report back. Second, Giovanni L.A. Hold Hair Spritz! Okay, so I delayed getting hairspray after my purge, thinking I didn’t “really” need it and most brands cost about $10/bottle. Unfortunately, this meant I couldn’t wear my hair up, because I can’t stand the falling-down fly-aways that happen without hairspray. And, honestly, I’m one of those people who like my hair to be neat and without the hairspray, all of those little pieces that wouldn’t lay flat after midmorning drove me nutso. THIS hairspray to the rescue! Giovanni products are vegan with a few exceptions of beeswax in their lip balms and milk in some of their products. They do not test on animals, they do not put phthalates in their products, most fragrances are created naturally from essential oils and plant extracts, and many of their ingredients are certified organic. This hairspray smells slightly floral, and holds lightly all day without being stiff (although this is touted as “maximum hold,” I don’t think it can be compared to the hard/crispy hairsprays we remember from high school). At least the hairspray holds enough that I don’t have to fuss with my hair in the mirror at work with those crazy fly-aways. I haven’t tested the up-do hold, yet, but I’ll do more homework and get back to you on this. It also hasn’t had to stand up to any crazy humidity yet. I’m happy with it so far, so I hope it works for the occasional bun or ponytail. It cost $7.95 for 5 oz…which will probably last about 4 months for me. Not bad. 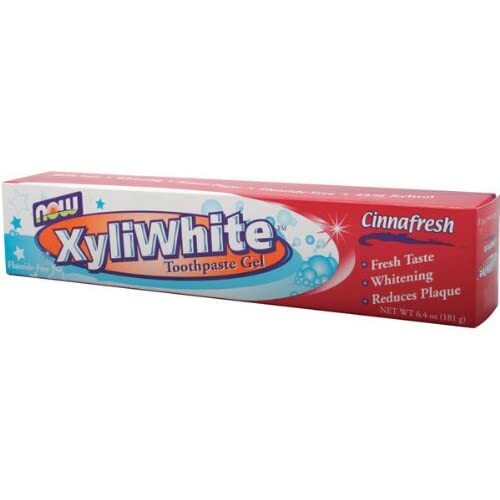 And yes, ANOTHER toothpaste: Now XyliWhite Cinnafresh Toothpaste Gel. I have decided for my own health concerns to avoid fluoride. This toothpaste doesn’t have any fluoride, but it does have xylitol, which works to prevent cavities by killing bacteria. It also contains papain (a fruit enzyme) for whitening effect. The paste itself is very much like gel, but it has the same color as beeswax, which I suppose could be a bit off-putting at first, but at least it’s not full of fake food dyes. Here are the other ingredients: water, hydrated silica, glycerin, sorbitol, sodium bicarbonate, sodium carbonate, sodium coco-sulfate, carrageenan (Chondrus crispus), cinnamon (Cinnamomum cassia) leaf oil, tea tree (Melaleuca alternifolia) leaf oil, potassium sorbate. Keep this FAR away from dogs, because the high quantity of xylitol could be fatally toxic (this is true for anything containing xylitol, obviously). I like the cinnamon flavor, but it certainly isn’t as powerful as Jason’s Powersmile pepperminty-blast of fresh. It does foam up nicely even though it doesn’t have any SLSes, and the slick-clean sensation is about a 9/10 for me. I feel like my teeth keep that quality longer than with regular toothpaste…like it’s 11 pm now (I brushed my teeth around 8:30 am), and there’s no noticeable plaque-y feel on my teeth like there normally would be. I find this amazing! It cost about $4.39 for a big 6.4 oz tube. On www.iherb.com, you can get other flavors, and it is on sale for $3.81 right now. It’s a definite thumbs up, and I am happy to feel un-conned on fluoride with this one. AND…although I haven’t tried any of their products, the Yes To Inc. company that creates Yes to Carrots and Yes to Cucumbers (and other vegetables)…have passed the no phthalate test! They have a wholly organic line of baby products, which of course are good for adults to use, too. They also avoid the use of parabens and SLSes. They try to use as many organic and non-synthetic ingredients as possible, so just read the labels to see if there might be anything objectionable in it. They do not test on animals and most products are also vegan…those that aren’t contain only beeswax and honey. This is another brand that is widely available at WalMart and drugstores, but you might find a better selection at a “natural” store. You can also shop at their online store, of course. So, huzzah for finding another good and easy to find natural brand. Options are awesome and variety is the spice of life! Next time…the deodorant test continues. Spoiler Alert! I am breaking up with Tom’s of Maine forever! Found this bag by Credo Bags today...love! I was asked to contact Aveda and Philosophy specifically by friends and I contacted each company and finally received responses from each company. Verbatim from their e-mail response: “Aveda’s plant-based mission and principles, on which the company was founded, have always steered us toward using plant-based or plant-derived ingredients whenever possible. In keeping with this mission, Aveda products are developed using pure flower and plant essences and are phthalate-free. Aveda does not use phthalates in its formulations.” So, this is good to know, however, I have learned to go ahead and take a look at the other ingredients to make sure that nothing is listed there that might be harmful in a different way. Secondly, Philosophy. Also, verbatim from their e-mail: “thank you for contacting philosophy! we do have many different products that are phthalate free. please reply to this email with any specific products you are interested in and we would be happy to verify if they are phthalate free.” Yes, the e-mail contained no capitalized letters. Weird. Anyway, this is more of a “skirting the issue” response to me, because while Philosophy does have some phthalate-free products, they are not committed to using natural products, and so, don’t. This means that phthalate-free products may have different harmful chemicals in them. I confess to completely crushing my sister-in-law’s favorite lip gloss from Philosophy by letting her know that it contained three different ingredients that are considered to be carcinogenic, bio-accumulating, and/or endocrine disrupting. Whoops. So, I am debating crafting a doozy of an e-mail in response, listing every Philosophy product I can find, also asking pointed questions about the oxybenzone, octinoxate, and benzyl benzoate they put in their lip gloss. So, if you want to hunt down info about specific chemicals, you can either read up on wiki or head over to EWG’s Skin Deep database. They have a big databank of products that they grade based upon ingredients. There are a couple of caveats with the EWG database, though…some of their listings are outdated and therefore do not necessarily have the current product formula in the database. They also score heavily for potentially harmful side-effects that don’t necessarily affect people in the same way. For instance, I am not allergic to fragrances. Anything with an undisclosed fragrance (possibly because fragrances can contain anything from phthalates to synthetic fragrances that do not occur naturally) gets a high score of 8/10. Hence my research that entails actually contacting the companies and asking for clarification. However, if you want info about a particular chemical, it’s a good source. And my own review of the ridiculously cheap, homemade baking-soda-based deodorant spray that I wrote about last time: Day 1, I wore a wool sweater over a long-sleeved tee and jeans, the temperature high for the day was 50 degrees, and I did not do much in the way of exercise. Day 2, I wore a loose jacket over a t-shirt with a scarf (and jeans again), the weather was a little warmer, and I matched the same level of effort for the day. I am not a sweaty person, usually, so I’m not really concerned about wetness, but on the funk-level, I am more concerned. In all honesty, I have to say that at the end of each day, there was surprisingly *almost* no stink. I think this works better than Tom’s for me. And when I say almost, that means, there wasn’t zero odor, but I’d say it was at about 97% funk-free even the next day. Day 3-4 were spent on the weekend doing not much. Then came Monday, which was, notably, the first day I wore synthetic fabrics. And this was the first day of funk. I thought maybe I had not applied enough. So, of course, like the good little researcher I am, I made sure I put enough on the next day, and wore another outfit of synthetic fabric. Same result. I switched back to cotton, and voila, no stink! And then, I did go to the gym. And I did sweat. But I did not stink. So all those health classes touting natural fabrics to allow the body to breathe weren’t lying! Natural fabrics allow any moisture to wick away. Synthetic fabrics?…not so much, therefore encouraging funk-causing bacteria to grow. So, at least for me, I will continue to use the non-aluminum, baking soda and water “deodorant” on those days when I wear natural fibers, and someday, when I splurge on the La Vanila stuff, I’ll use that when I wear the synthetics. In the meantime, though, I have stumbled upon a reason to buy more natural-fiber clothes. Oh, dang. P.S. The only drawback to the baking soda and water formula is that the spray pump seems easily clogged by the baking soda in the solution, so I now I just “splash” it on. Maybe less baking soda or more water will reduce that problem? Next batch I’ll tinker with the amounts. But, definitely a thumbs up. Try it!